Going on a cruise when we turn 50 years old seems like a good idea right now. It was discussed around and plans are being made. I got a note from Bennie who’s on top of it (of course). So I’m going to let him talk now. Ok, so you’re not quite even recovered from our big blowout this past weekend and here comes another temptation to let your hair down (for those of us who still have it anyways). But do not be alarmed, we’re talking about an event that’s at least a year and a half away, an eon of time to consider the ramifications of such a foolhardy endeavor as planting your feet on a seagoing vessel (also plenty of time for a new-fangeled remedy to get that hair back). So here’s what happened this past weekend… Everyone who got together in Sarasota had a great time, they saw old friends and universally said it had been too long. Talk of time ultimately brought up the fact that everyone was fast approaching the Half Century Mark (50 years for you non-math folks) and conversations quickly lead to ideas about celebrating everyone’s 50th birthday. Now two honest facts about this is that it was some of the girls who got this started and they had intentions of making it a real “Girl” thing but that quickly got squashed by some of us guys who thought that our Half Century of Life on this good earth was just as worthy of celebration as theirs. The second fact of this celebratory coalition is that it is not unique. There are many classes who have these 50th Birthday Bashes so we can’t claim originality, but by god, by the time it’s all over and done with, we will be able to claim superiority! A little known fact is we first tested the waters for a cruise for the 30th Reunion and met with some favorable responses. Ultimately we decided that the land based option would provide for a better turn-out and we certainly did have a good showing. Some of those who knew of the original plans still had a hankering to cruise the seven seas though and thus was born the Birthday Bash Cruise idea. I have all ready heard from at least 10 people to count them in, so in effect, this email is the start of the flushing out of this idea. First the good news, whatever we decide, we have an honest to goodness, bona fide expert to help us through this whole cruise business. Lorrie Feid and her husband own a Cruise Travel Agency in Sarasota and they have the means to help us put this thing together once we decide what we want to do. You ask, What is there to decide? Well deciding to pick a cruise is about as easy as picking a pair of Black Shoes out of my wife’s closet. Although I could easily come up with at least a couple dozen personally, she felt it was necessary to have new pair that better fit the occasion. These seven factors, while not entirely, do somewhat encompass what you need to consider in selecting a cruise. Many of these factors are intertwined and have an effect on the other criteria in the selection process. For those of you who have cruised before the following may be a bit of what you already know, but for the sake of those who are cruise novices, a bit of a primer follows. The date on which you would like to take your cruise can influence your decision to a great degree. If price is an important factor in your cruise decision, you will find that a cruise you like can be one price on a certain date and be a completely different price on another both higher or lower. In other words cruising is a capacity based travel option just like hotels and airlines. There are cheaper times of the year to cruise than others. One other factor that time has on a cruise is that if your cruise destination(s) are in the Caribbean, during the summer months you have the possibility of Tropical weather. It was suggested by some folks that we go in November after the tropical season but then that starts to get close to the holidays when people are looking for time off for family reasons. I guarantee you one thing for certain, we will never get a unanimous decision on time of year. 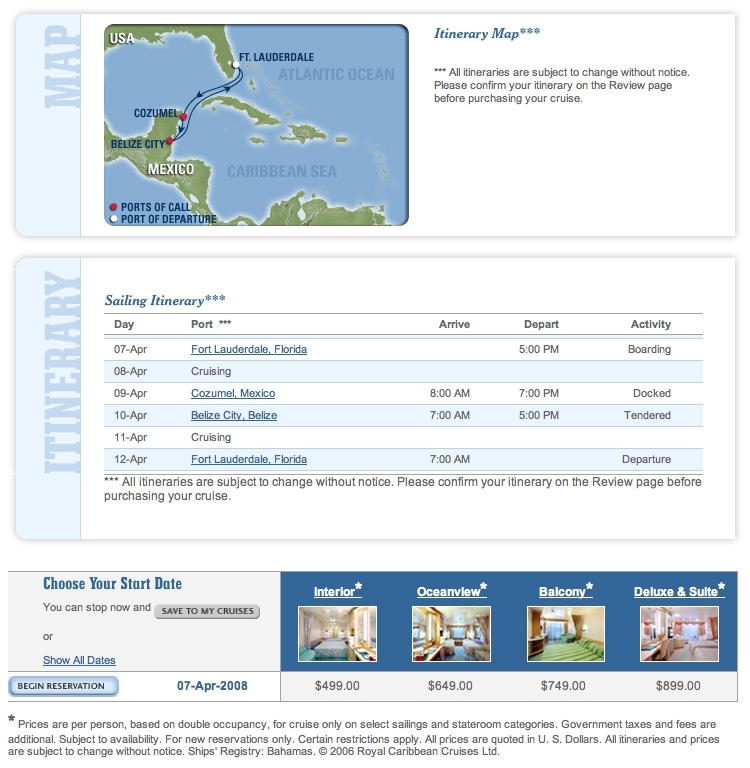 Two things are for certain, late Fall and Early Spring are good times to find lower cruise prices. to your departure port you might need more time than a week off from work can get you. that would not be appropriate for a group like ours where cost is one of our primary concerns. rule of thumb is newer is usually better. Louisiana, several locations in Florida and island ports like San Juan. The farther the port from your home generally the more your total cost is. can take you, there’s a cruise that can get you there. Time of year and price considerations are your only limiting factors. “Therein Lies The Rub” You can spend 39.95 for a day cruise ticket and tens of thousands on 3-week transatlantic journey. Ultimately we have to decide what is the worth of this celebration of our 50 years of earthly servitude and what follows is my humble attempt to put a price on such an endeavor. We are going to take your input on what you think is best and try to come up with a consensus. But with a little research I am going to put forth one initial suggestion to put everything in a frame work so that we can have a common starting ground to begin our discussions. The time of year is one of the better pricing periods, it misses the tropical weather season, it misses the big holiday season, it is with one of the better cruise lines, the ship was brand new in 2002, it is one of Royal Caribbean’s larger ship categories (over three football fields long), it has a couple of exotic ports of call, and it has a weekend before and after for traveling to and from the departure port.